Summon birds to roost in your yard with the Heartwood Flock of Ages Bird House. 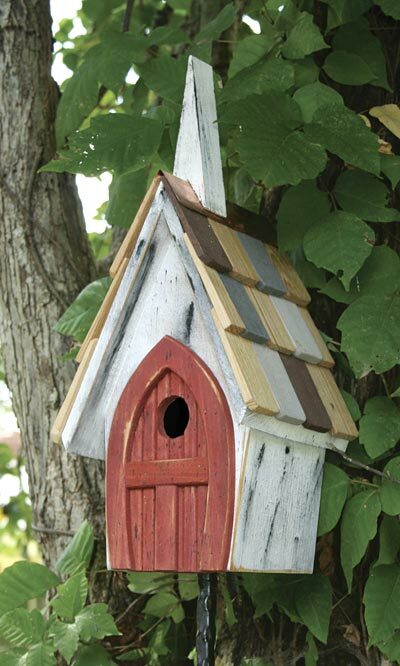 Designed to mimic a small chapel, this home will surely delight you and your avian visitors. The antique white body and steeple easily capture attention, while the gothic red door adds a touch of color to the piece. This faux door accommodates a 1.25" diameter entry hole, for your smaller songbirds. The steeply pitched roof lends a classic look to the church, and multicolored shingles with copper flashing at the top enhance it further. A slight gap on the base of the roost allows any captured water to escape the nest, and slots underneath the roof keep the internal temperature regulated. A copper panel on the back of the item may be removed for cleaning and nest checks, and the flat base is perfect for mounting this home to a pole or post (not included). Invite an avian family to congregate in your yard with this Flock of Ages Bird House. Made in the USA.